Our own pins made for Green Mountain Diapers. Good pins do make pinning easier. Sold in pairs. Order 1 pair and you receive 2 pins. I really do love to pin! Nothing beats the custom-fit and comfort of a pinned prefold or flat diaper. A pinned diaper is so classic, comfortable and adorable. After much frustration trying to find excellent diaper pins, we had our own made for Green Mountain Diapers to our specifications. I am very happy with these pins. Sharp pins slide through fabric more easily than blunt pins. Lubricating pins by pushing the point into a bar of Ivory soap or other bar soap before using helps any pin slide, so do lubricate your pins! The stainless steel part of the pin needs to be sturdy enough not to bend when you slide them through fabric. These pins are both sharp and firm and without burrs. Good pins do make pinning a little easier. They don't have fancy box packaging. These are sturdier and stronger than the cheaper pins. Do not buy painted metal head pins unless the seller can show you that they have been tested for lead paint and can show you the CPSIA compliance certification of their current stock of pins (which is pretty unlikely due to the low profitability of selling diapers pins compared to the very high cost of the testing and certification). We recommend choosing plastic-head pins such as these or our free pins and avoid painted metal for your safety and baby's safety. These pins are open stock without packaging. That saves money and materials. They have slide-lock baby-safe heads. Always use a cover over diaper pins or other diaper fasteners. Made in Malaysia. These are so basic and inexpensive. Often those are my favorite products to use in everyday life. 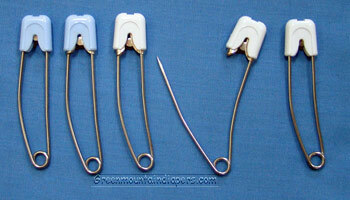 These are strong pins, love the click as you lock the head in place, and they glide through the prefold diapers easily. I find I can get a more snug fit using pins rather than a snappi. One came unpinned but the rest seem to be holding up. These pins work the best for me so far. I struggled with snappis and other pins, and these are much easier to use.